This summer, when we weren’t looking, a huge, paper nest blossomed and fruited and swelled, large and ripe in the doorframe of the house we’ve been renting. I may have noticed it when it was the size of a plum, but the next time I looked, it was the size of a cantaloupe, and abuzz with life. It’s now bigger than a watermelon. The residents are fat and black with creamy white tiled faces and three matching stripes on their abdomens. 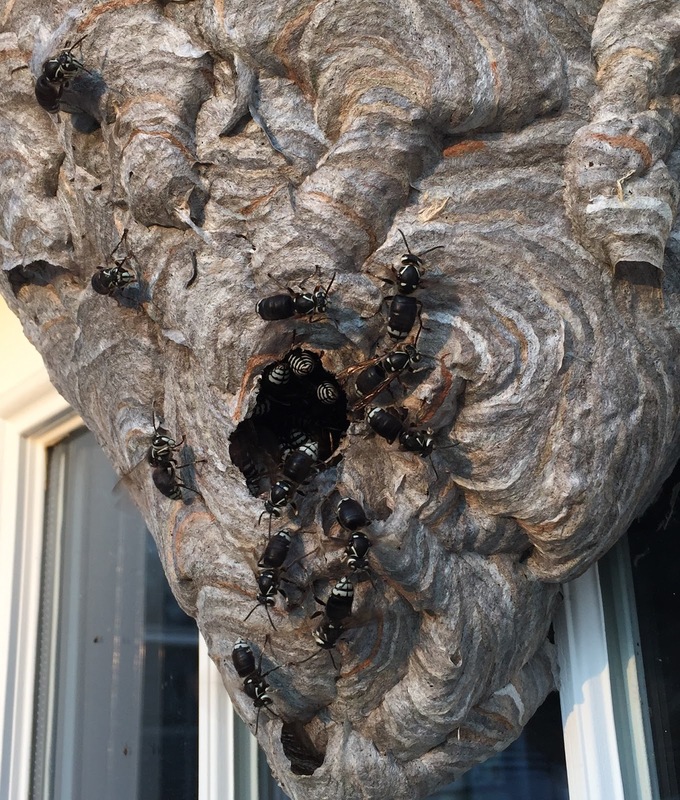 I idly recognized them as “paper wasps,” because of their oblong, gray and brown striped paper nest. After a couple of weeks I realized the denizens were fatter than the wasps I’d thought were “paper wasps,” so I did a little investigating. There are perhaps 1,100 kinds of “paper wasps.” Our guests are bald-faced hornets, and actually in the same family as yellowjackets. Some folks call them blackjackets. Depending on the site, Internet searches will either reveal these busy and meticulous nest-builders as aggressive or defensive. Some exterminators say you can’t safely get within three feet. Others say they’ll leave you alone if you leave them alone. On sunny days, I like to stand a few feet away and watch them fan the entrance. One or two guards will whizz past my ears when they’ve had enough of me. I can watch as long as I like from the safety of the inside of the garage and get very close. Inside the great gray-brown striped football are many layers of corridors just big enough for the wasps. I have read that they’ll be all gone after the first frost, in mid-October. Only the new queens will survive, overwintering in the bark of nearby trees. I am practicing being calm and tolerant of them. From what I’ve seen, the advice that only a professional should remove one of these nests is quite sound; because this nest is against the glass of a window, I’ve peered into the chambers. There are many hornets inside, and they are not asleep at night. The sky bright and the afternoon just beginning to wane, we pulled our minivan into the long, single-file line of parked cars to wait for the ferry to Anacortes. There was once a snack bar here, a shack of weathered wood with a small deck in the shelter of a grove of towering douglas firs. The kids had piled into a bench on the far side of the table. The youngest was first in. He was 3 or 4 years old. Those late summer yellowjackets in the Pacific Northwest sting without provocation. They dive into a can of soda. They eat unattended hamburgers. They land on your arm and sting you while you’re standing at a party and not swatting them. They are a known menace. As we discussed who was getting rootbeer and who was getting 7Up and how many fries we ordered and whether we’d get ketchup, a yellowjacket landed and lingered on my youngest child’s cheek and was crawling towards his eye. He, like all of my kids, was very afraid of being stung. He closed his eyes and did not move. I promised him, with the certainty and truth of adult logic and the power of all mothers, everywhere, and every mother that ever lived, that if he held very still the terrible stinging yellowjacket wasp would fly away on its own. It crawled all over his sticky little face, its abdomen pulsing as it explored the pale tender flesh and even ventured up and tickled his eyelashes. My other kids were aghast. They were witnessing their worst nightmare, unfolding slowly next to them. They wanted to scream. They wanted to climb across the table away from their lost brother. It was more than they could bear to witness. One had to pile both hands over his mouth to keep from shrieking. Even my husband wanted to do something– blow on it or swat it. I calmly and silently insisted that it would leave on its own. My husband and I disagreed so strongly on this point that we exchanged ten thousand angry words and ideas, rapidly, fluidly, and without a single sound. The previous summer I was stung four or five times by one yellowjacket on Lopez Island; it had flown up my pant leg while I was weeding and it had gotten trapped. I ran to the house, tearing my overalls off as I went. I had swatted my leg without looking, and it was the swatting that provoked the stings. But then, on the deck of the ferry station snack bar, all of our faces agrimace in the various rictus of frozen panic, while the youngest persisted, quiet, relaxed, calm and serene as the terrible yellowjacket prolonged the threat of a painful sting. And as suddenly as the wicked little thing had appeared, the nasty, venom-filled, late-season yellowjacket finally paused in its pulsing and crawling and tasting of the face of my child, whirred its transparent lacy wings and lifted itself into the air. It flew away. No sting. We cheered.